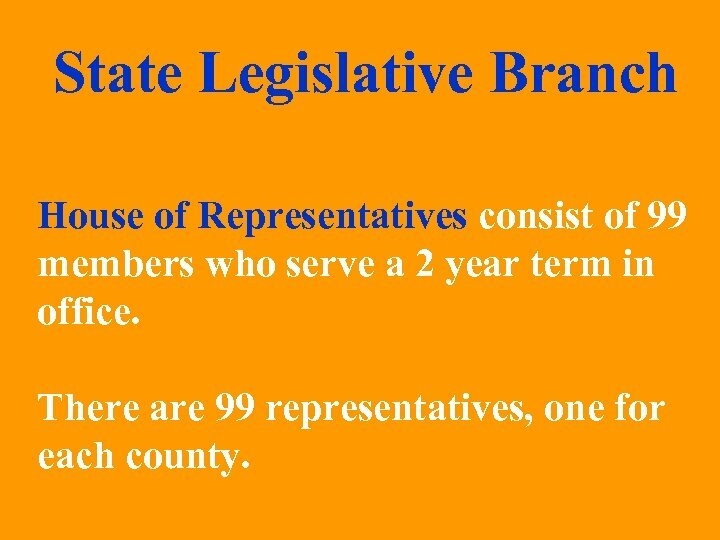 State Legislative Branch House of Representatives consist of 99 members who serve a 2 year term in office. 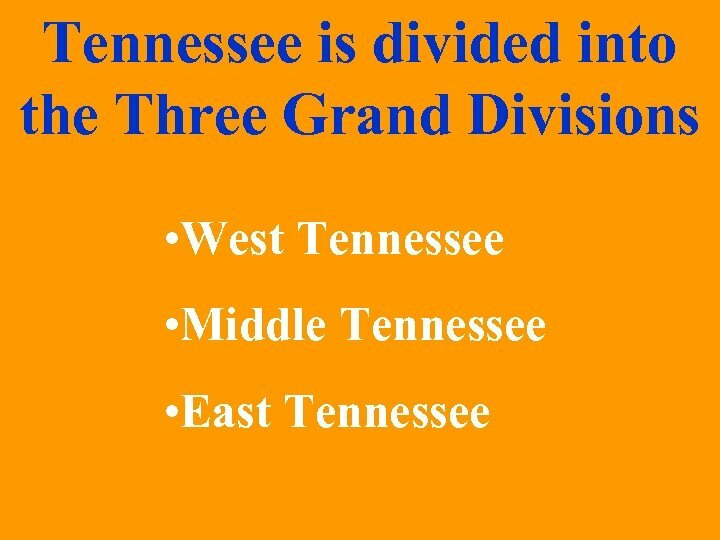 There are 99 representatives, one for each county. 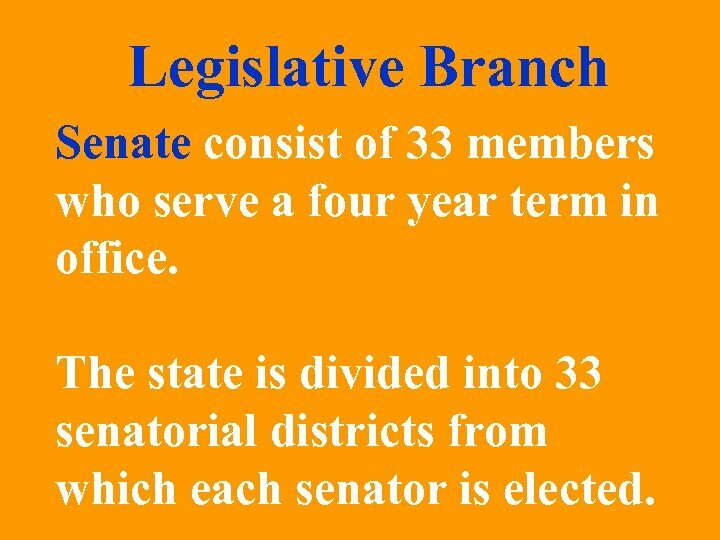 Legislative Branch Senate consist of 33 members who serve a four year term in office. 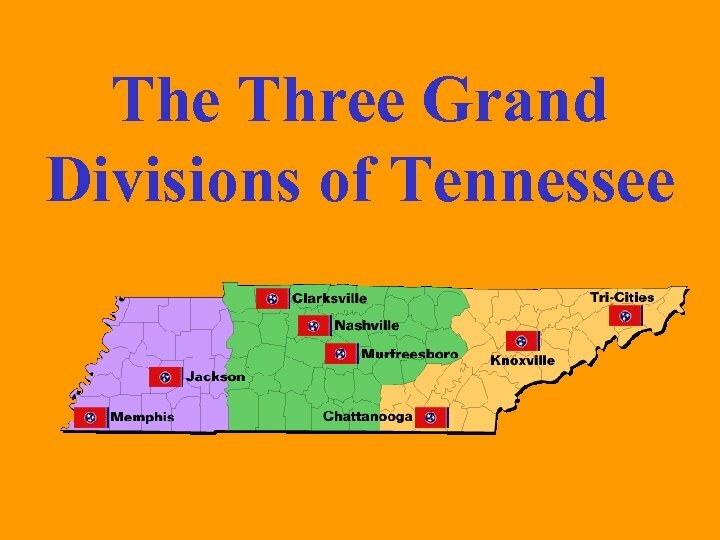 The state is divided into 33 senatorial districts from which each senator is elected. 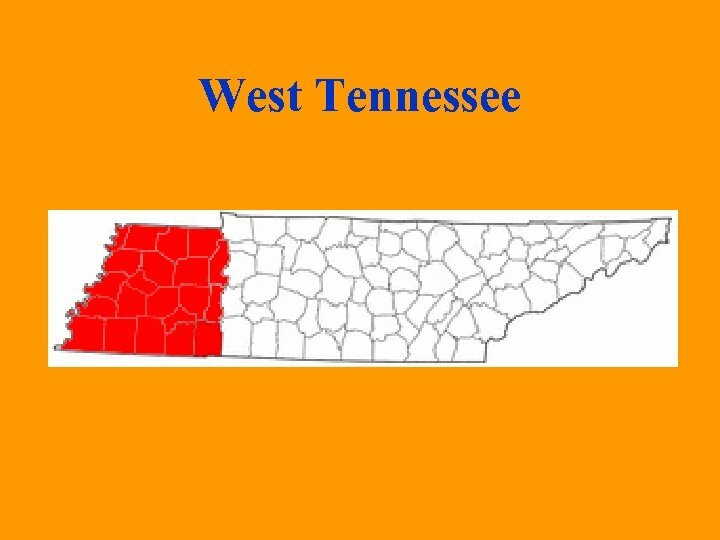 West Tennessee Major City: Memphis known for being a center of shipping and trade for the South. 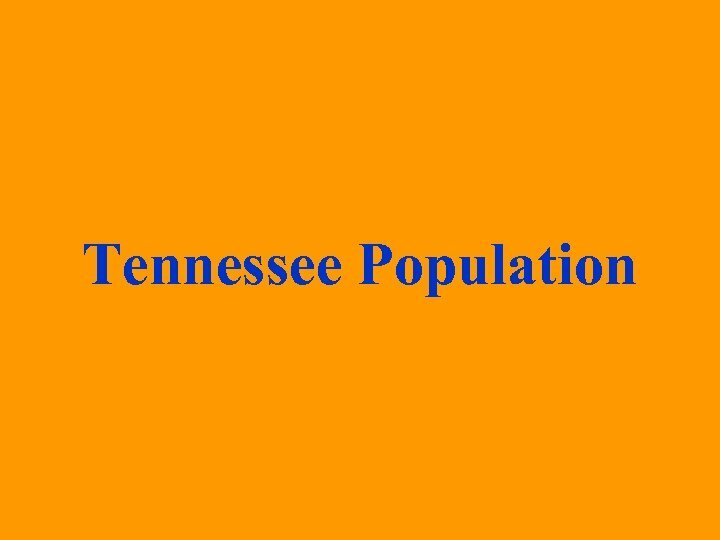 Home of Elvis Presley, and Oprah Winfrey. 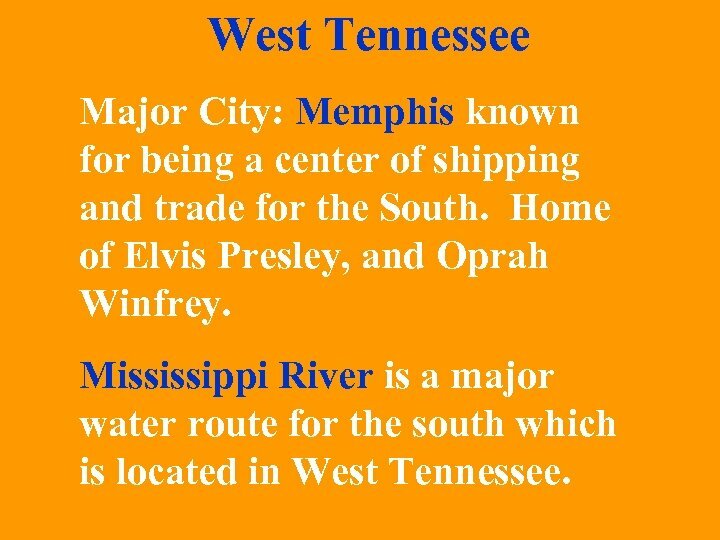 Mississippi River is a major water route for the south which is located in West Tennessee. 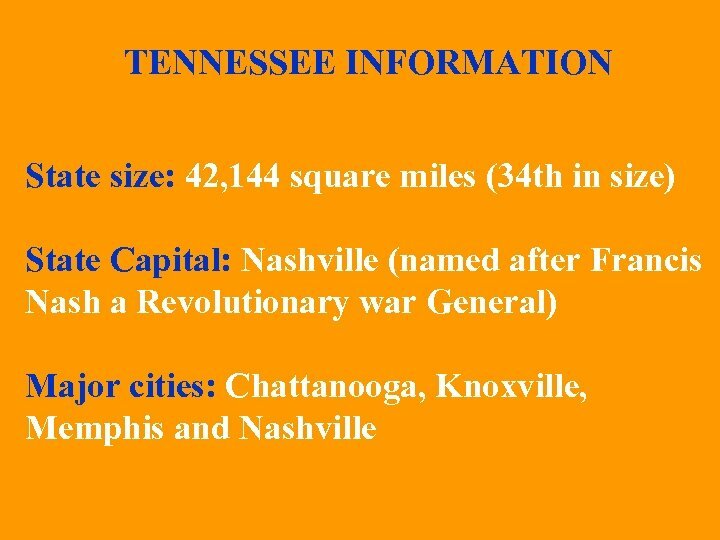 Middle Tennessee Major City: Nashville which is the capitol city of Tennessee and known for being the road way to country music. 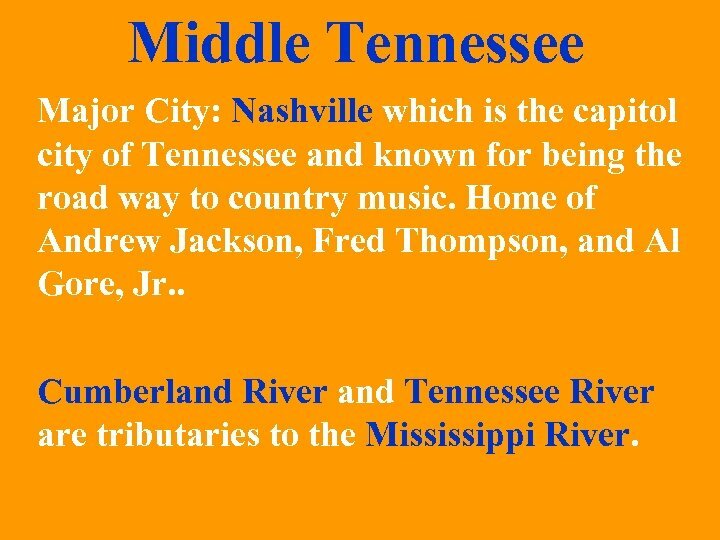 Home of Andrew Jackson, Fred Thompson, and Al Gore, Jr. . Cumberland River and Tennessee River are tributaries to the Mississippi River. 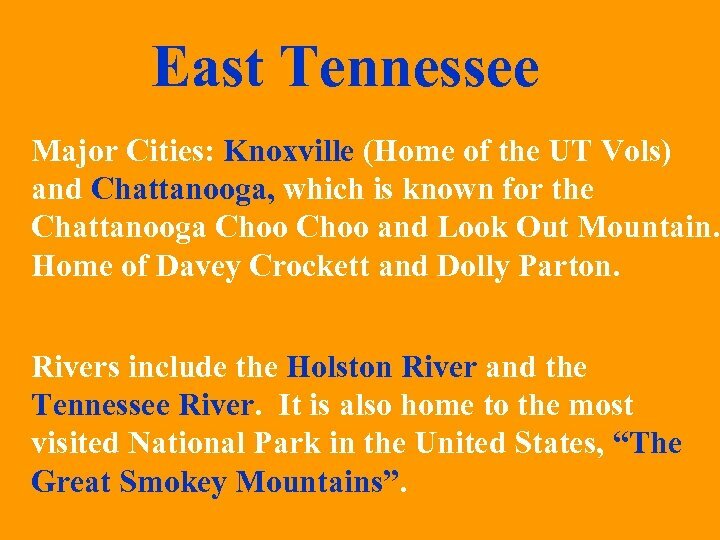 East Tennessee Major Cities: Knoxville (Home of the UT Vols) and Chattanooga, which is known for the Chattanooga Choo and Look Out Mountain. 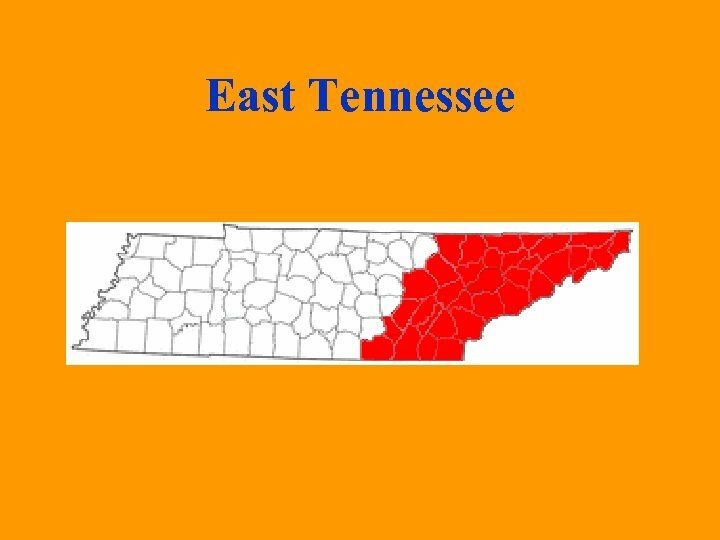 Home of Davey Crockett and Dolly Parton. 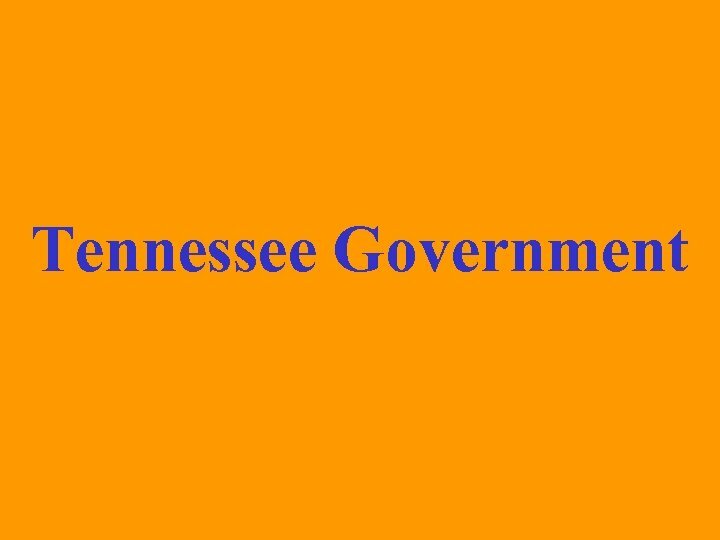 Rivers include the Holston River and the Tennessee River. 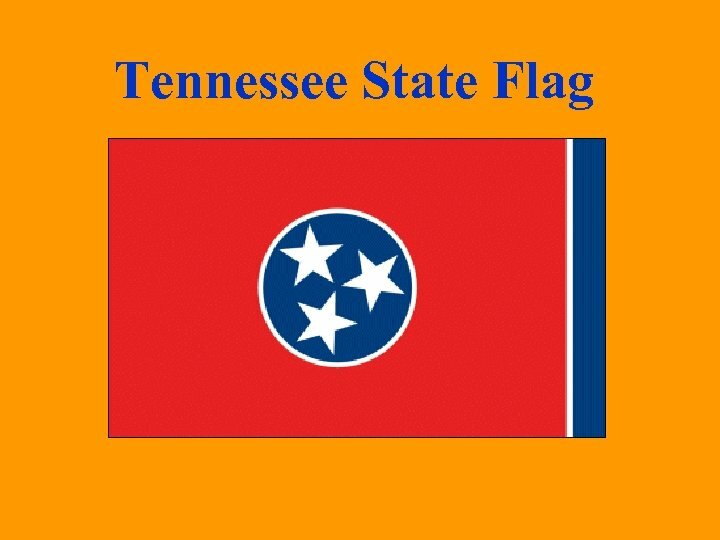 It is also home to the most visited National Park in the United States, “The Great Smokey Mountains”. 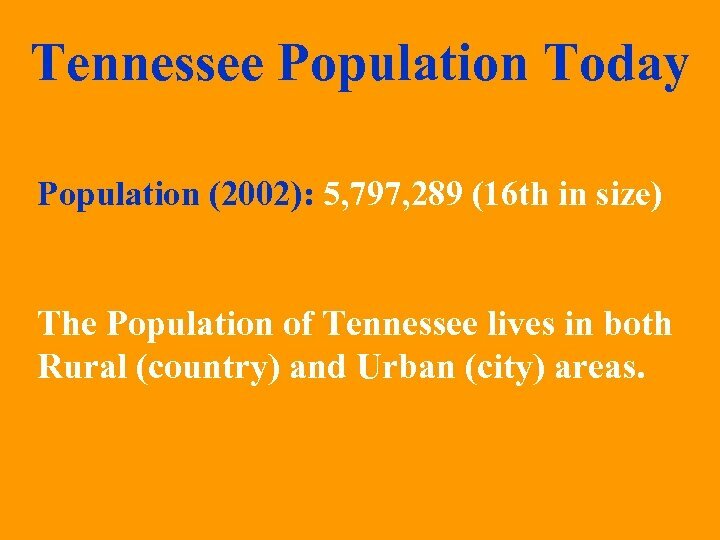 Tennessee Population Today Population (2002): 5, 797, 289 (16 th in size) The Population of Tennessee lives in both Rural (country) and Urban (city) areas. 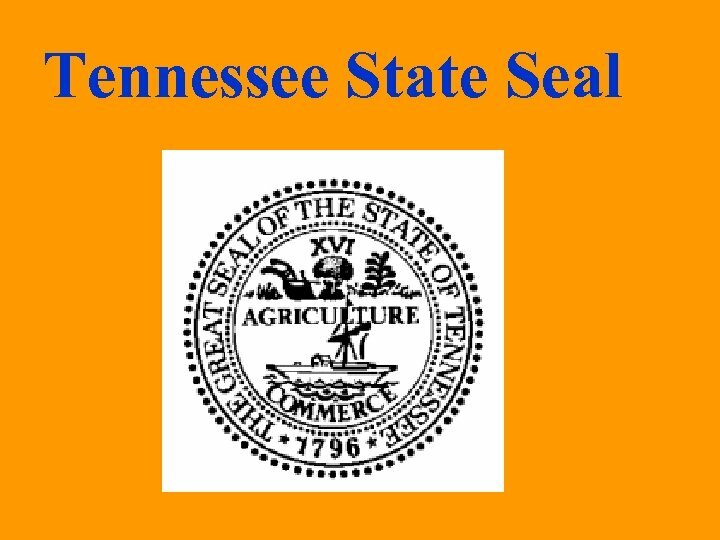 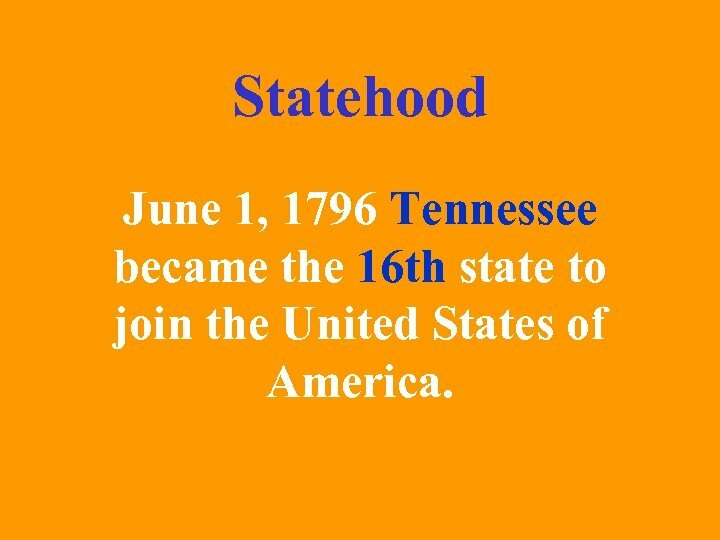 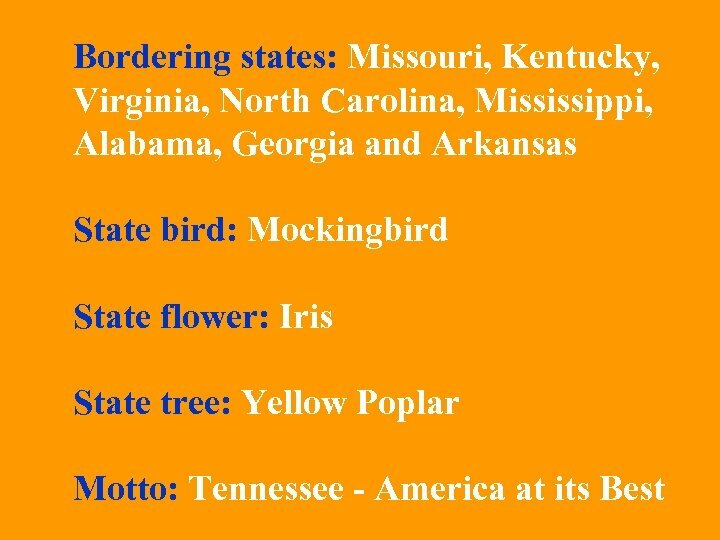 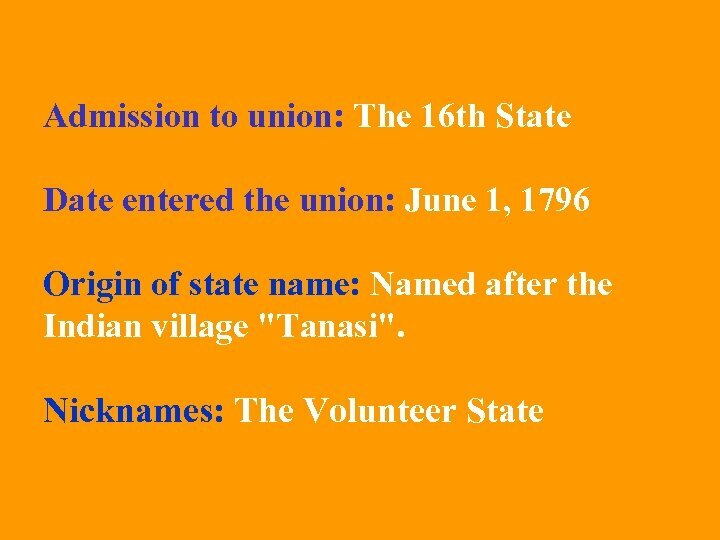 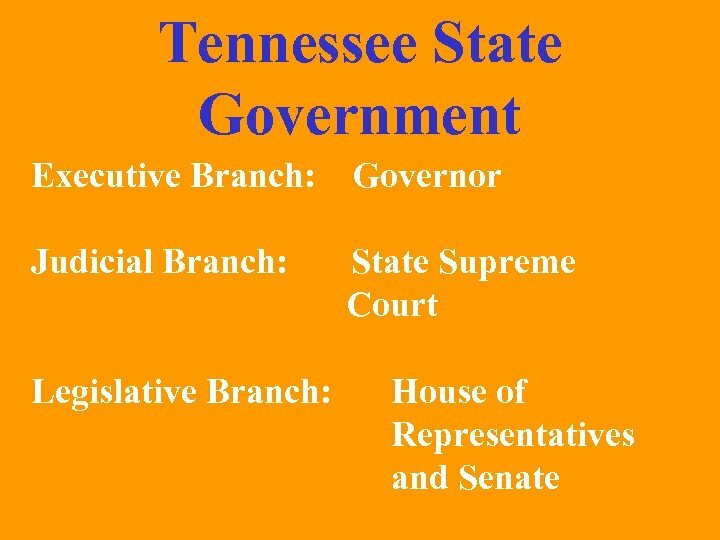 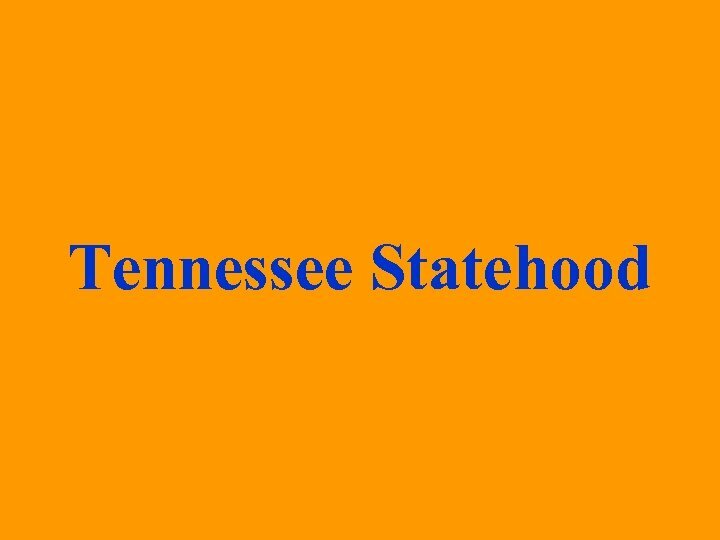 Statehood June 1, 1796 Tennessee became the 16 th state to join the United States of America. 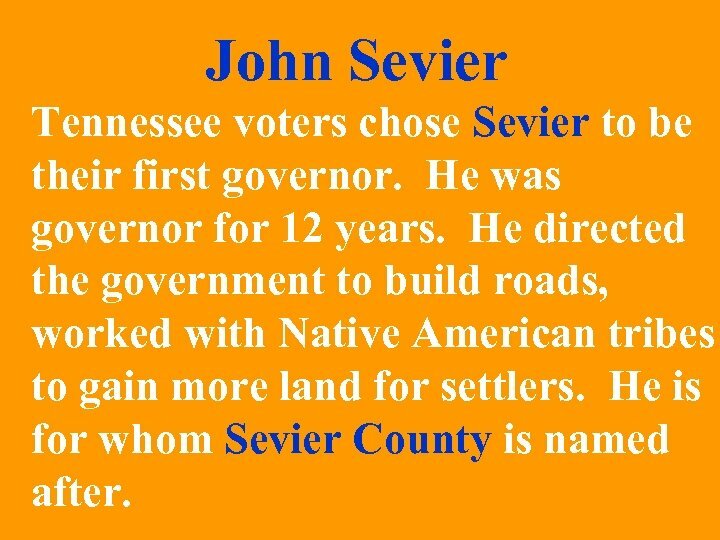 John Sevier Tennessee voters chose Sevier to be their first governor. 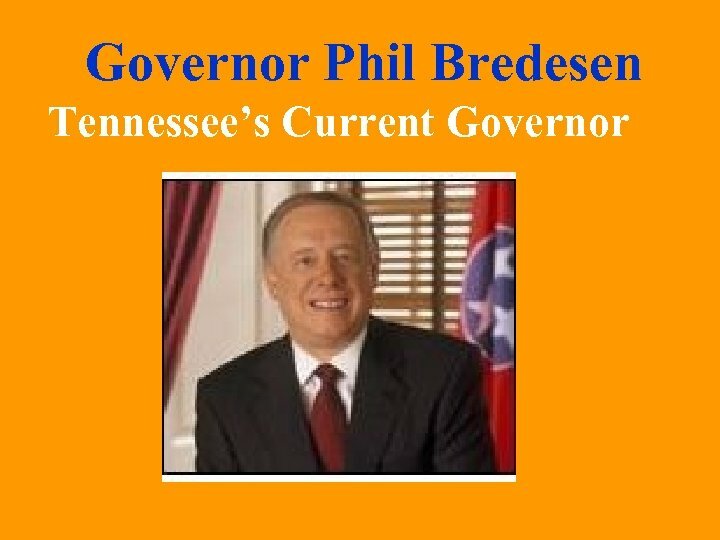 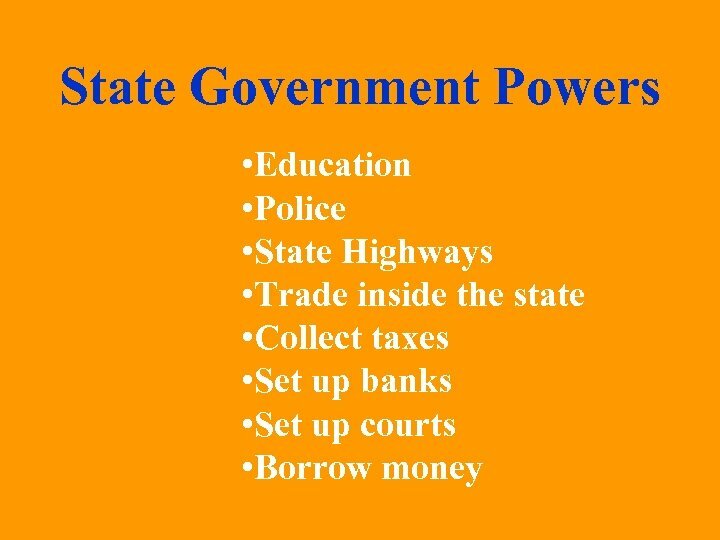 He was governor for 12 years. 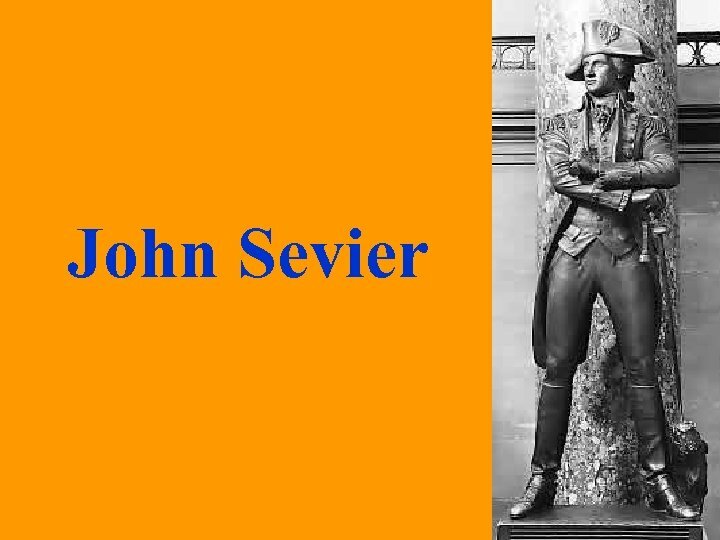 He directed the government to build roads, worked with Native American tribes to gain more land for settlers. 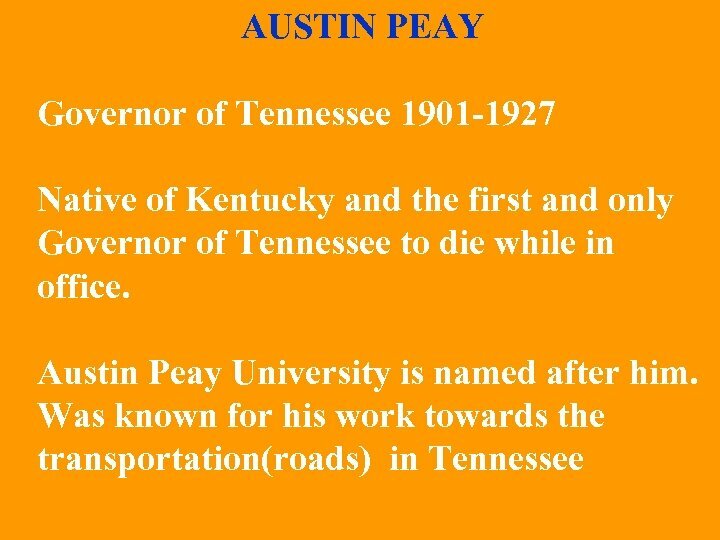 He is for whom Sevier County is named after. 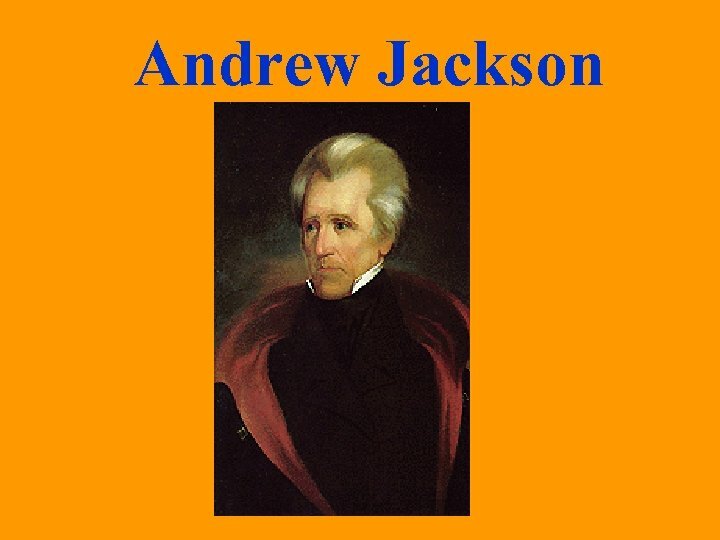 Andrew Jackson played a role in founding the city of Memphis and won election to the United States Congress. 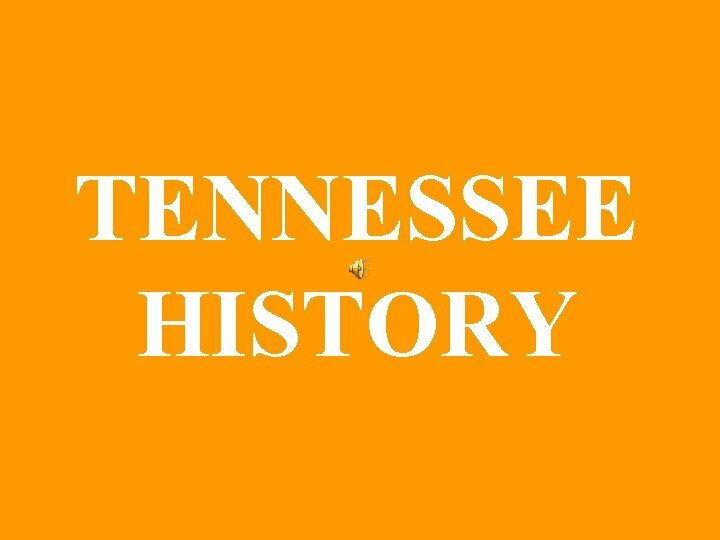 During the war of 1812 he volunteered to fight and earned the nickname “Old Hickory”. 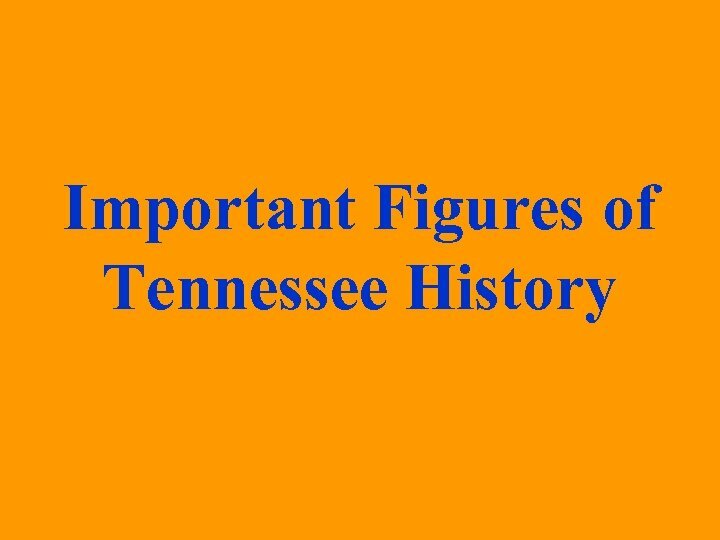 Jackson was elected 7 th president of the United States in 1828 and elected a second time in 1832 because he was a war hero. 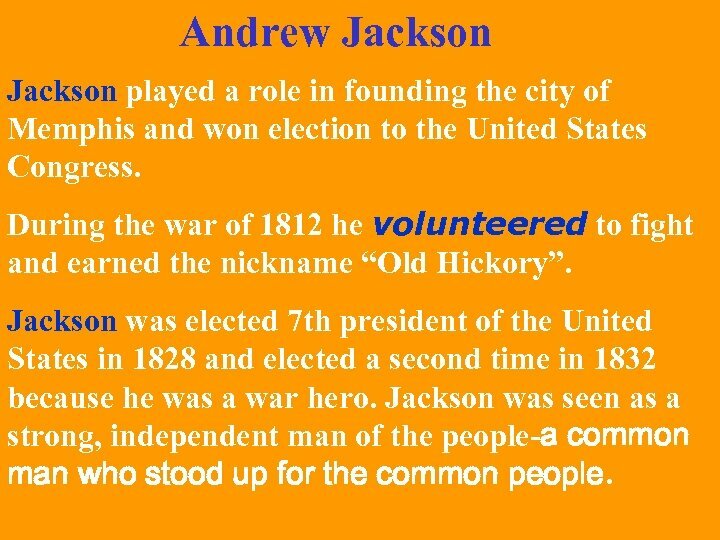 Jackson was seen as a strong, independent man of the people-a common man who stood up for the common people. 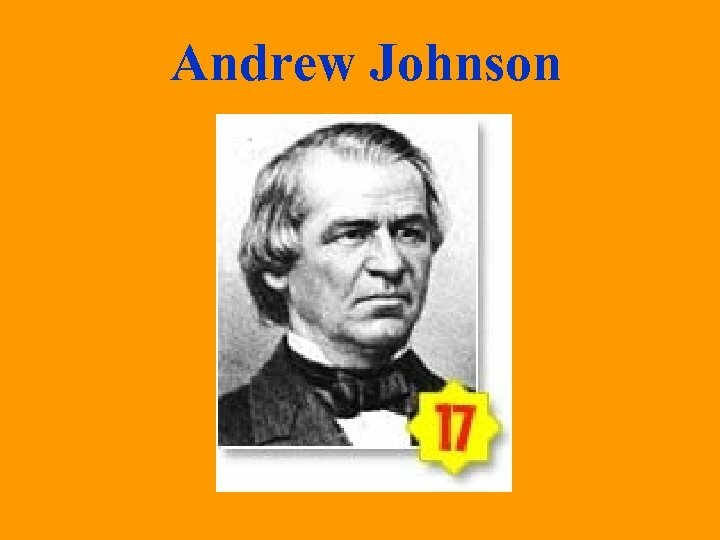 Andrew Johnson Five days after the war ended, President Abraham Lincoln was killed. 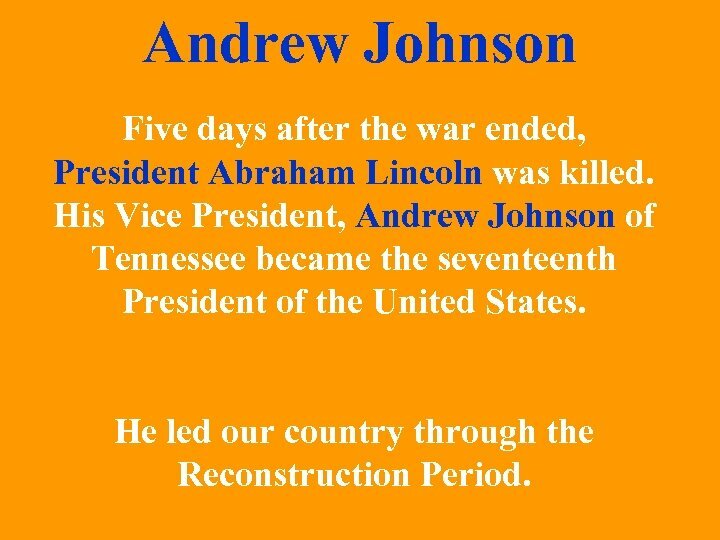 His Vice President, Andrew Johnson of Tennessee became the seventeenth President of the United States. 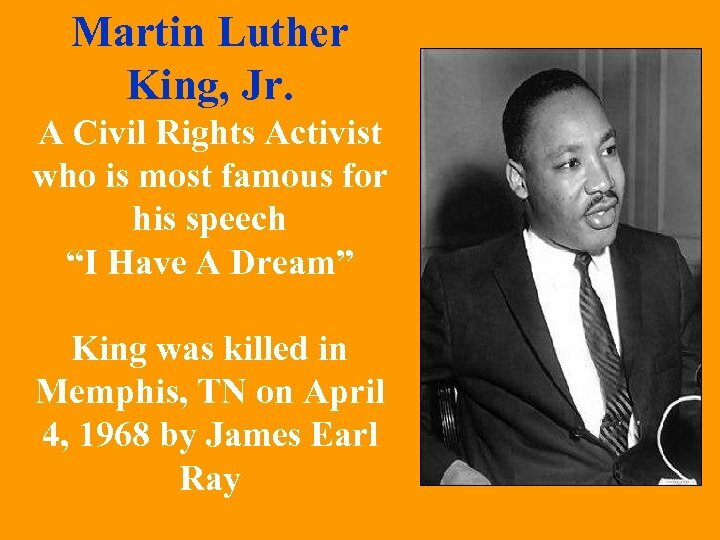 He led our country through the Reconstruction Period. 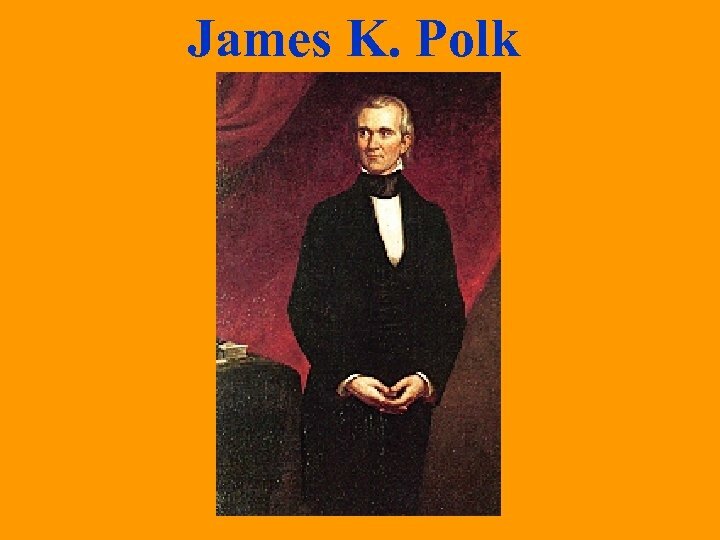 James Polk was a United States Representive and a speaker of the House. 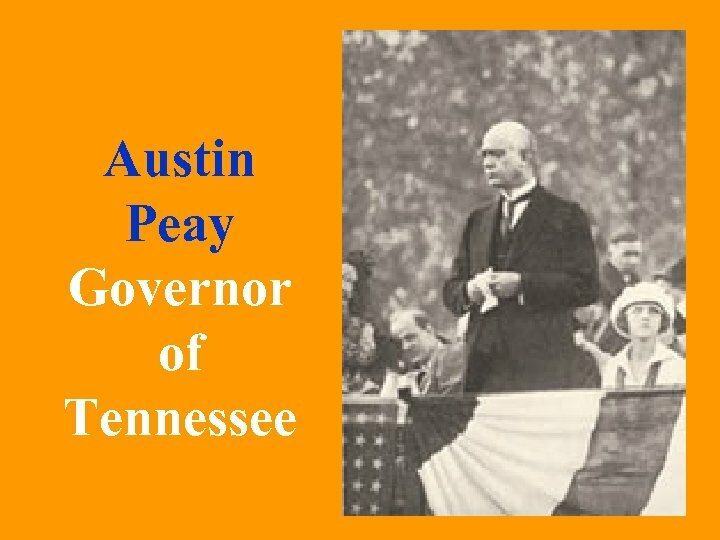 He was elected to be the 11 th president of the United States. 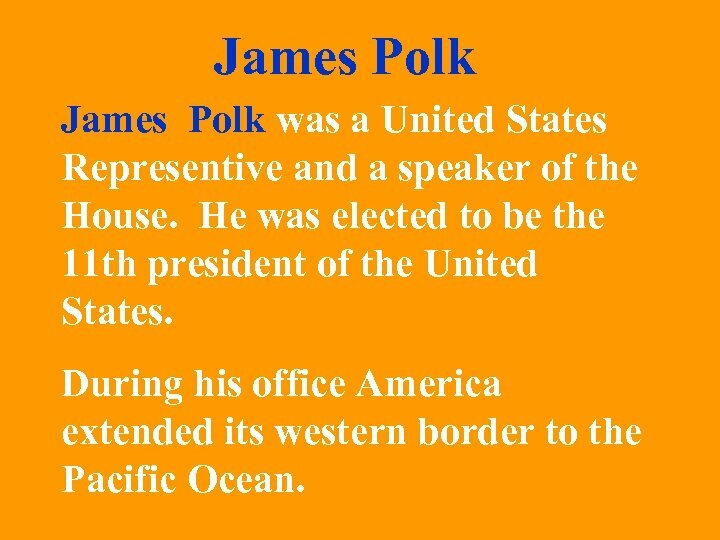 During his office America extended its western border to the Pacific Ocean. 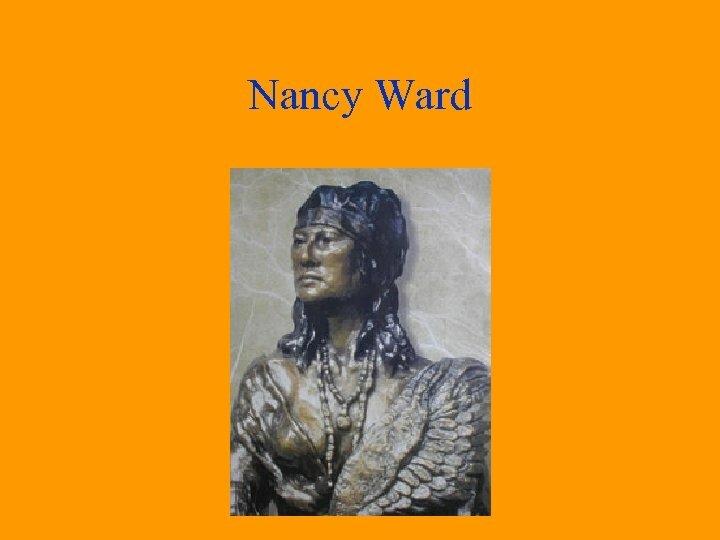 Nancy Ward • born as a member of the Cherokee tribe sometime around 1738, her Cherokee name was Nan’yehi. 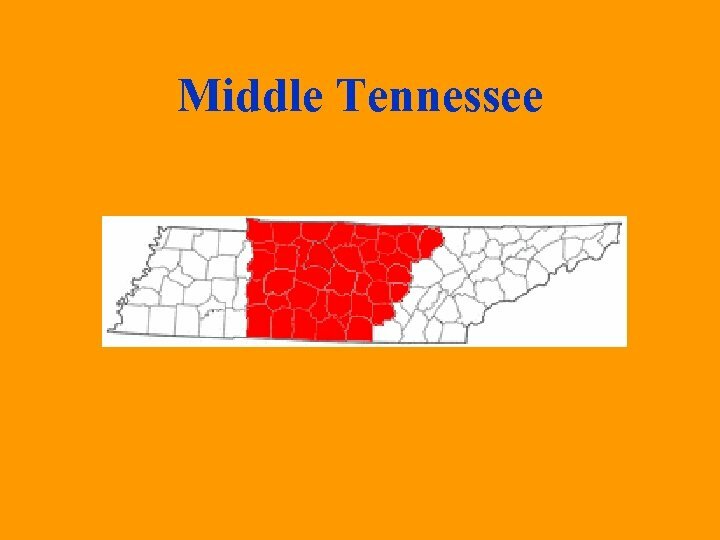 • as European settlers took over parts of Tennessee, she began to blend into the white world, and she became known as Nancy Ward. 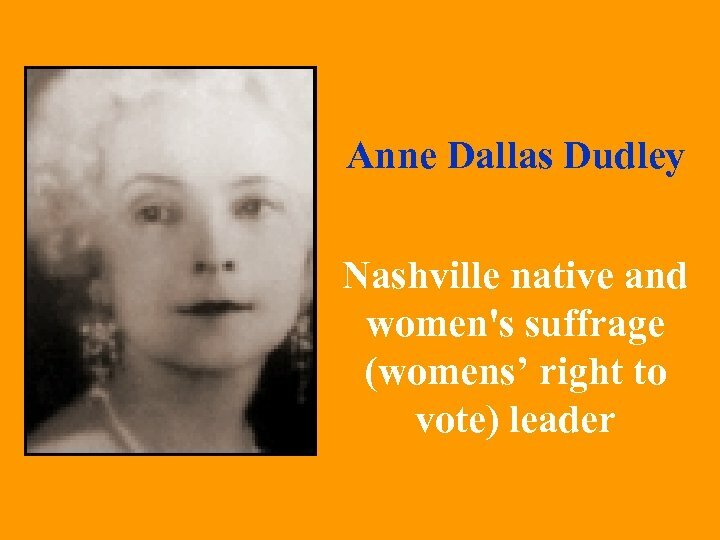 • She was known to help keep the peace between Cherokee people and the European settlers. 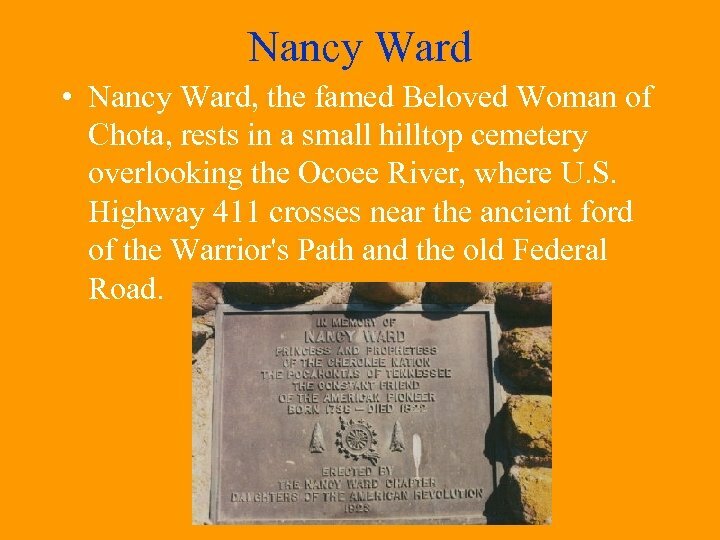 Nancy Ward • Nancy Ward, the famed Beloved Woman of Chota, rests in a small hilltop cemetery overlooking the Ocoee River, where U. S. Highway 411 crosses near the ancient ford of the Warrior's Path and the old Federal Road.